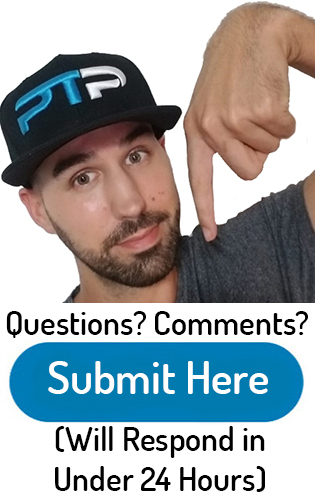 Hey guys and gals, if you are looking for a complete breakdown of the NASM CPT personal training certification, you have come to the right place. Here I’ll be breaking down how NASM organizes the exam into separate sections and what those sections are. You will learn all about how hard the NASM CPT is to pass as well as the current NASM exam pass rate for 2019. You will also learn the differences between NASM practice tests vs the real test. I’ll be talking about the cost of the NASM test and lots of other NASM frequently asked questions. So without further ado, let’s jump right in! 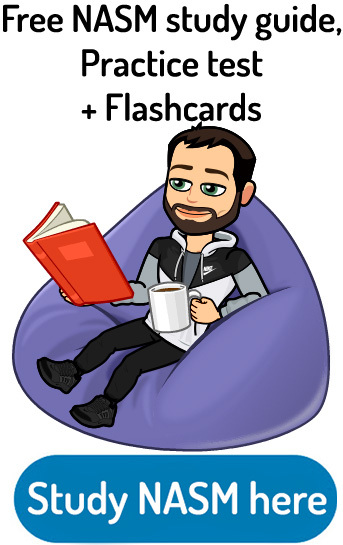 If you are anxious to start studying, you can check out my free study guide, practice test in flashcards here! If you are undecided on which personal trainer certification to choose, I suggest you take the quiz to find out which Cert is the best fit for you. NASM test difficulty - How hard is the NASM CPT exam? Are there NASM practice exams? What is the exam enrollment period? How many questions are on the NASM exam and whats a passing grade? Where can you take the NASM exam? What are the prerequisites for the NASM exam? Can you see your exam score afterward? What happens if you fail the NASM CPT exam? When do you receive your certificate after taking the exam? How long is the NASM certification valid for? How much does the NASM test cost? Currently, in 2019 the NASM CPT test is comprised of six separate domains. Out of the 120 questions on the exam, each of these six domains occupies a certain percentage. Here is a list of the six domains, the percentages on the test, the chapters each domain covers and a quick summary. I will be referring to the most current NASM textbook, the sixth edition. Domain 1: Basic and applied sciences and nutritional concepts (17%) (Chapters 1-5, 17 and 18) This domain covers the human body, the systems involved with exercise/movement and their adaptation to exercise. You will be tested on the nervous system, muscular system, skeletal system, cardiorespiratory system, endocrine system, and energy systems. A testy one the study of kinesiology as well as how forces affect the body (biomechanics). Questions on the planes of motion, movement terms, muscular imbalances, types of movements and kinetic chain dysfunction. Domain 2: Assessment (18%) (Chapters 6 and 16) Domain to tests you on all the processes of assessing a client. You will be tested on all of the various exercise assessments such as cardiorespiratory assessments, strength assessments and muscular imbalance assessments such as the overhead squat assessment. Domain 3: Program design (21%) (Chapter 14 and parts of 7-13) Here you will be tested on the various training principles needed in order to design a program for a client waste on their goals and needs. You need to know different acute variables such as tempo, training volume, resistance, rest periods and intensity for all of the different stages and types of training for the OPT training model. Domain 4: Exercise technique and training instruction (22%) (Chapter 15 and parts of 7-13) In domain number four you will be tested on, core training, flexibility training, balance training, SAQ training, reactive training and resistance training. You will be tested on which exercises fall into which type of training, how to perform them as well as how they relate to the OPT model. Domain 6: Professional development and responsibility (10%) (Chapter 20) In domain six you will be tested on the types of training facilities, their demographics and how to be a professional and responsible personal trainer. You also be tested on marketing and sales techniques and strategies to become successful. NASM test difficulty – How hard is the NASM CPT exam? I get asked all the time by visitors to my website “How hard is the NASM CPT exam?”. To be honest, I’ve seen people that have failed the test over three times and I have also seen people that came out of the test after 1/2 an hour who told me they feel like they did not miss one question. Overall, the NASM certification has been notorious for being one of the more difficult in the industry over the last decade. NASM has made their test difficult on purpose because they are trying to raise the standard for the knowledge required for personal trainers. Sometimes it seems like NASM reached deep into the textbook to pull out one single sentence of information and then test you on it. Other questions seemed like they are trying to trick you with the vague wording that they use. Plain and simple, this test is hard, but that doesn’t mean that there aren’t strategies you can use in order to successfully pass it. The best way to gauge the NASM test difficulty is to look at the stats from the previous years. 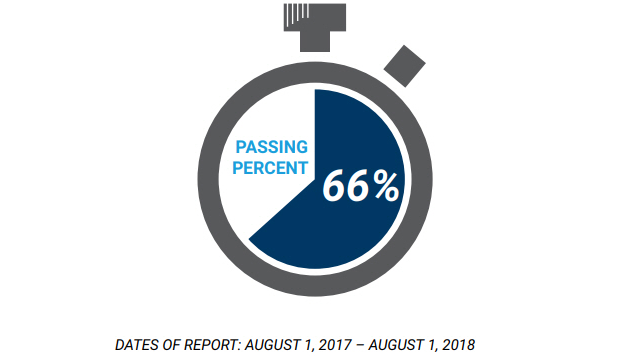 Although the NASM exam is constantly being changed, the average pass rate for the last few years is approximately 65%. 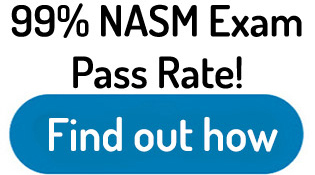 In 2015 the NASM pass rate was 67%. 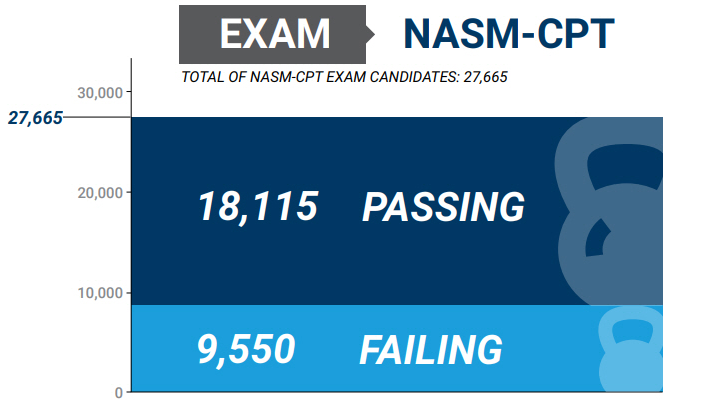 In 2016 the NASM CPT pass rate was 61% (one of the lowest years). The most recent data released by NASM is the passing percentage between the dates of August 2017 and August 2018 which reveals in that time. 18,115 students passed and 9,550 failed. This equates to exactly 66% pass rate between those two dates. It’s safe to say that one in three people will fail the NASM personal training exam. In general, this personal training certification is difficult compared to the average personal training certification. That being said, it is still the most well-recognized and prestigious certification out there so don’t let these statistics scare you. You just need to be prepared, that’s all. Another popular question I get is what art are the differences between the NASM practice tests and real tests? This is a very good question in general because there are a lot of websites that provide practice tests for the NASM exam. In general: The NASM practice tests are created by people that don’t work for NASM, while the real test is. The NASM practice tests are compiled from people’s experiences of the test, whereas the real NASM test is constantly changing and never static. Overall, you will not find the exact NASM personal training exams online compared to the official test. This is because NASM is constantly switching the questions that they have on the exam. My guess is that every few months they take out some old questions and throw in some new ones. They probably change the wording on a lot of them as well. If they had one static test of 120 questions that never changed, people would figure it out very easy and this test would be spread across the Internet within months. It would reduce the legitimacy of the NASM brand and to be honest, would result in a ton of personal trainers that are not equipped with the knowledge needed. Although you will not see the exact same question (written word for word the same) on the real tests compared to the practice tests, they are still fantastic for learning different ways in which questions can be worded. These practice tests will still cover the same information that you will see on the real test. In my experience from the thousands of people I have helped pass the NASM exam, if they receive a passing grade from my practice tests, they have no problem with the real NASM exam. Many of them have even told me that they saw some of the exact same questions on the real test compared to my practice exams. That is is the NASM practice test vs real test summary. Here are additional NASM exam frequently asked questions I get. Yes, absolutely. There are plenty of NASM practice exams both free and premium options. NASM charges a lot for their practice tests and they do not generally give you too many practice questions overall. From the date that you purchased the NASM package, you have 180 days to get CPR/AED certified, organize a test date, and take the test. There are 120 questions on the exam. 20 of those questions are research questions that do not count for your final score. You will have two hours to complete the exam and you must score a 70% or higher in order to pass. In order to take the NASM test, you need to set a test-taking appointment at a PSI test taking facility. You can locate the nearest PSI test taking facility here. You need to have your enrollment ID number ready with you when you contact PSI. In order to set a test date, you need to call PSI at the number 1-833-537-1330. What do you need to bring to the test taking facility? The prerequisites for the exam are that you are a high school graduate (or equivalent), or at least 18 years old and have a valid CPR/AED credential. NASM recommends the following organizations to receive your CPR/AED certificate: the American Heart Association, American safety, and Health Institute, American Red Cross, St. John Ambulance, emergency medical technician or emergency care and Safety Institute. No, NASM never releases exam scores whether you fail or you pass. They simply tell you which one after you take the test. If you fail the NASM test, you will have the option to purchase a retest voucher. Depending on the package purchase from NASM, a retest voucher may or may not be available to for free. If a retest voucher is not included in your package, you will need to pay $199 for the retest voucher. You will then need to call NASM member services at 1-800-460-6276. After failing the exam your first time, you need to wait a full week before the second attempt. If you fail a second time, you need to wait a full 30 days before attempting for your third time. If you fail your third attempt, you need to wait one full year in order to attempt the exam again. After passing the exam, your certificate will be mailed to you 4 to 6 weeks later. You will be able to access a web copy of your certificate three business days after passing the test. You can print your certificate from their as well. 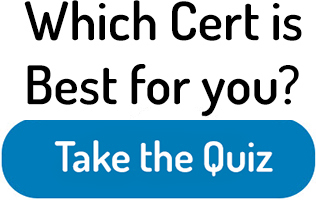 After taking the exam, your certification is valid for two full years. During that time you will need to receive continuing education credits. NASM requires 2.0 continuing education credits in order to get recertified after two years. This approximately equates to 20 hours of continuing education. The NASM personal training certification has multiple different packages to choose from that include different study options and perks with each. If you want to know more about each package, check out my NASM review here. The exam only option costs $599. This option comes with no study materials, not even the NASM textbook. Well, there you have it ladies and gentlemen, a complete breakdown of the NASM test. Overall, the exam is one of the more difficult personal training tests to pass in the industry. The textbook is over 700 pages long and can be very daunting because it is dense with information. If you are still are not sure whether or not NASM is the right certification for you, I recommend Taking the quiz to find which certification best fits your training style. How hard is the NASM test? Well, With the NASM exam pass rate being only 65%, and the retest fees being so steep, it’s best to have proper direction in order to study the most important areas. I have made a free NASM study guide that can be located here. 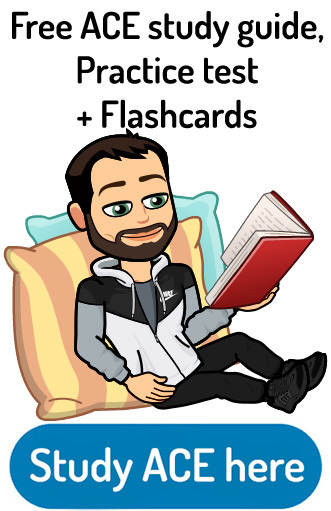 The study guide also has a free practice test as well as NASM flashcards so that you can cement the information in your head before the test. If you want to cut your study time in half, I suggest checking out my premium study materials for NASM. With my premium study materials, you will receive an exam pass guarantee! Hi Tyler! Nice review on NASM. I just passed my exam today 3/14/2019 on my first try, that test had me sweating bullets. The test is worded different, but the practice exam that NASM offer is a good resource as well as other online practice test. The only thing I can say is to make sure you understand the material and you will do fine on the final exam. Good luck!!!!! Super awesome that you passed the NASM exam! Congratulations and good luck starting a fantastic career in the world of personal training. I absolutely agree, study study study and you should do fine on the exam. People get very nervous before it, but if you come in well prepared you should do just fine.